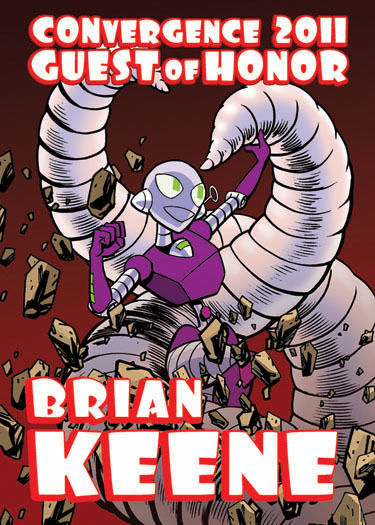 This was custom badge art I did for Brian Keene, the first year he visited CONvergence as a Guest of Honor. I do individual badge art fro all the convention’s guests, which is one of the things that helps the con make a unique impression on our visiting VIPs right away. I always try to tailor the badge art to the Guest of Honor’s work, or something about them personally. It gets easier if I’ve met them or am intimately familiar with their work. When it’s someone I’m not as familiar with, finding the right image can be a real challenge! I’d met Brian prior to his first visit to CONvergence, but didn’t know him *that* well. I went for the center of the strike zone and did a zombie image, referencing The Rising, probably Brian’s best-known work. Brian’s been back a couple of times. In 2009 I drew the CONvergence mascot Connie as Devil Slayer, as Brian had just written a Devil Slayer mini-series for Marvel Comics. In 2011 I opted to have Connie battling the giant worms from another of Brian’s epics, The Conqueror Worms. I try to avoid using Connie on badge art for Guests making their first visit to CONvergence, since until they experience the convention they wouldn’t understand or appreciate the unique role this mascot character has there. But once they’ve been to CONvergence and are coming back, Connie tends to pop up pretty often. Here are some other badges I’ve done for CONvergence in recent years with a Halloween flavor. 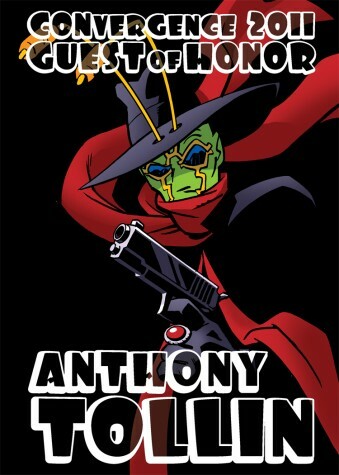 Anthony Tollin is a comic book colorist who is associated with, among many things, Keith Giffen’s Ambush Bug comics from the 1980s. He’s also a historian of The Shadow in both radio and pulp incarnations, and is currently publishing reprints of The Shadow and Doc Savage. So a mash-up of Ambush Bug dressed as The Shadow seemed like a fun idea. I’d been a fan of Bernie Wrightson for years, from Swamp Thing and his other comics work to his gorgeous illustrated edition of Frankenstein. 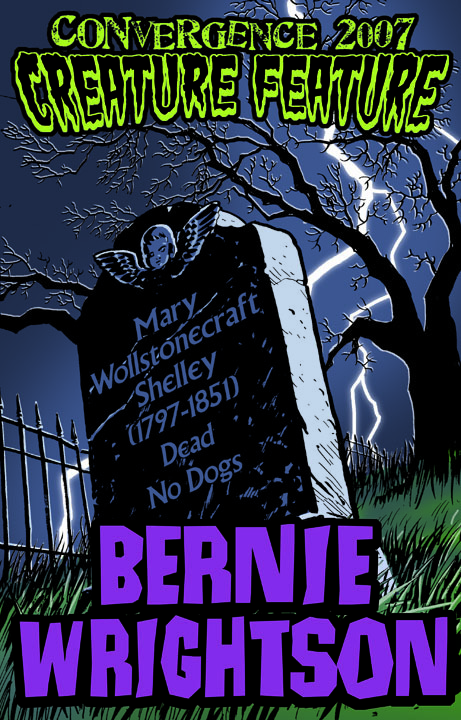 This badge art references a joke Bernie got into an early printing of that Frankenstein book. The author’s page at the back gave a lengthy biography of Bernie, concluding with where he then lived along with his two dogs. About the author or the original novel it only said “Mary Wollstonecraft Shelley is dead and has no dogs.” I thought that was hysterical when I first saw it, and was disappointed to learn that later printings replaced it with a more conventional biographical blurb. 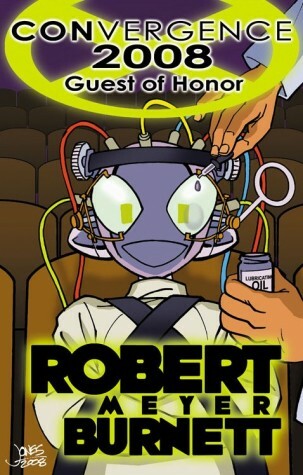 Robert Meyer Burnett, is a huge fan of A Clockwork Orange, and his production company Ludovico Technique is named for this procedure from the film. Poor Connie. Emily Hagins is a remarkable young filmmaker who wrote, produced and directed her first film – a zombie movie – when she was 14 years old. She’s a few years older now and still going strong. She recently got her first theatrical distribution deal with MPI Media for her third feature film – My Sucky Teen Romance. When she first visited CONvergence, I thought it would be fun to place Emily among the iconic zombie-slayers. And finally, in 2010 our convention theme was “Bad Guys,” and I placed our mascot’s evil sister Connie Mark 2 among the Children of the Damned for our “teen” registration badge that year. Conventions, Misc Artwork | Christopher Jones | October 22, 2011 2:14 pm | Comments Off on Happy Halloween… badges?